Starting an Environmental Non-Profit: How Similar to a Green Business? In a recent post, I interview Jack Norris, co-founder of Vegan Outreach, about the environmental impacts of our diets, and how he markets his organization. There is a great deal of similarity between some non-profits and for-profits, and aspiring social entrepreneurs have a choice to make in this regard. There are both benefits and drawbacks to either option. In the case of a for-profit business, especially in the green community, the obvious drawback is that customers won’t donate to your cause. They may preferentially choose your products over traditional competitors, but they may also come in the door with higher standards for products and services. 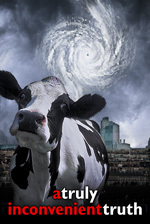 But certainly no one is going to make a movie about how much worse animal agriculture is for global warming than many other factors that people are myopically focused on and use it to raise money for your organization, for instance. In writing my book, Build a Green Small Business (McGraw-Hill), I interviewed hundreds of social entrepreneurs about their businesses, and found some interesting answers to questions about events they didn’t anticipate regarding their business. Does the classification of their business as a for-profit business help or hinder when it comes to unexpected events? When I asked Jack about some of these unexpected pains in the rear, he expressed discontent with the amount of government paperwork involved in filings to maintain your 501 (c)3 status. Since Vegan Outreach operates in numerous states, it doesn’t help the situation, and there’s not many things more frustrating than seemingly needless paperwork when all you want to do is promote something you’re passionate about. Most social entrepreneurs answered this same question with frustrations about marketing, customer relations, and information technology worries. The most common answer was something related to marketing, whether they were wasting money on certain avenues of marketing or not, and how they couldn’t tell which half of their marketing money was being wasted. So what to do if you’re deciding on whether you’ve got what it takes to be a social entrepreneur, there are a few considerations worth a lot of consideration. With the non-profit, a social entrepreneur could expect a lot less resistance in the general public, but nowhere near the potential financial reward, either. The stress is more likely to come from the constant fundraising, paperwork, and administration. It’s up to you to decide which situation you might prefer.